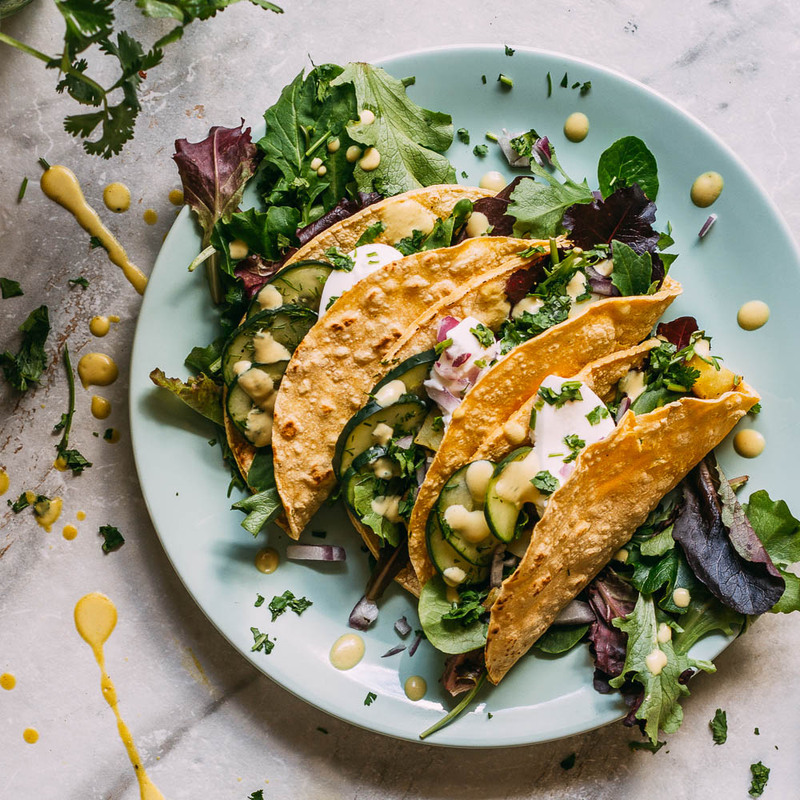 Our Quick Roasted Potato Tacos with Maple Mustard Sauce is a perfect flavor combo that rewards the taco and potato lover in you! And while the roasted potatoes are the foundation of this tasty handheld wonder, you’ll soon agree that the tangy Quick Pickles are a pleasant yet, unexpected, surprise. And is the drizzle of golden Maple Mustard Sauce the gorgeous crowning jewel, or what? It’s true, these Quick Roasted Potato Tacos with Maple Mustard Sauce are not the ordinary taco combo from your local drive-thru. But who needs another recipe for those? And yes, of course, we enjoy traditionally seasoned tacos as much as the next person. But make no mistake, you won’t miss those flavors while munching on these. 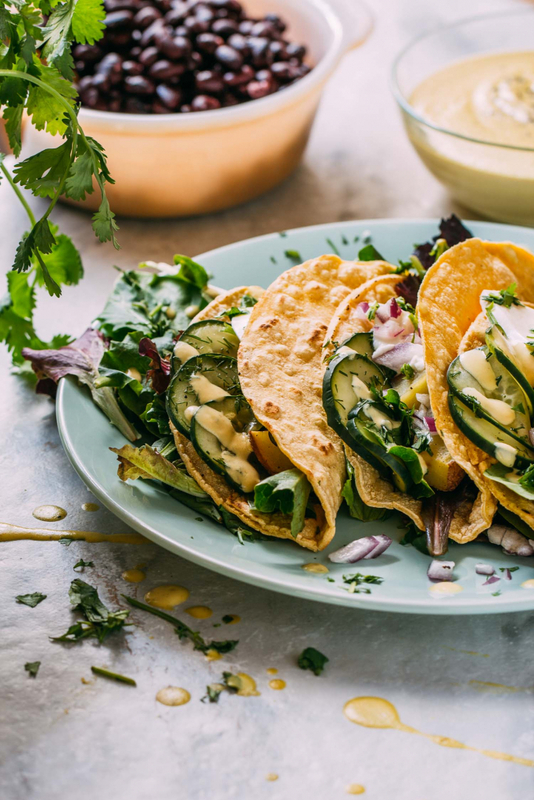 Potato tacos may soon become your new favorite! If you’re wondering how potatoes ended up snuggled inside warm and soft corn tortillas, we’ve got a secret for you. There are very few edibles in our house that escape the fate of becoming the filling inside a handy-dandy tortilla. We almost always an avocado or two on the counter and corn tortillas in the fridge, it’s how we roll. At our house, we look forward to having extra potatoes so that we can plop them onto a warm tortilla. We may even make extra mashed potatoes for the sole purpose of using the leftovers as a taco filling. 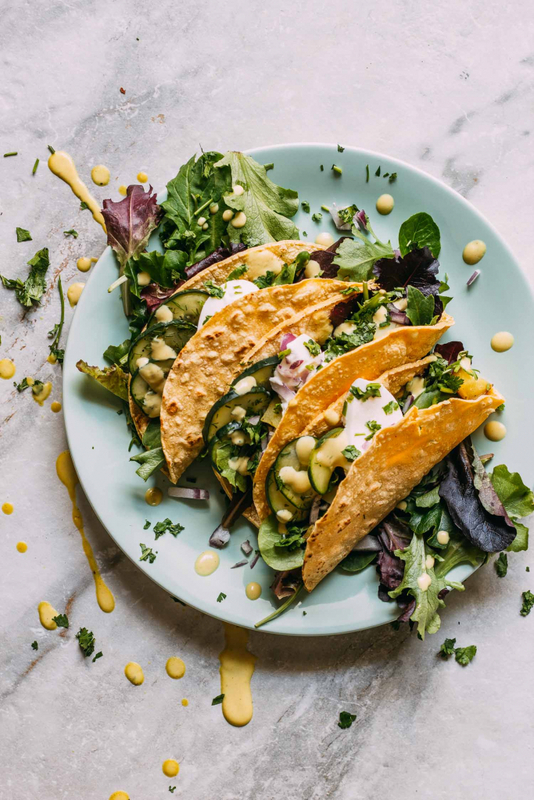 We especially like to top the leftover potato tacos with sliced avocado. Give us a bit of onion and crunchy sprouts or another fresh green, and we think we’re at a bistro! So how did we end up roasting potatoes for the ones in this recipe, you ask? 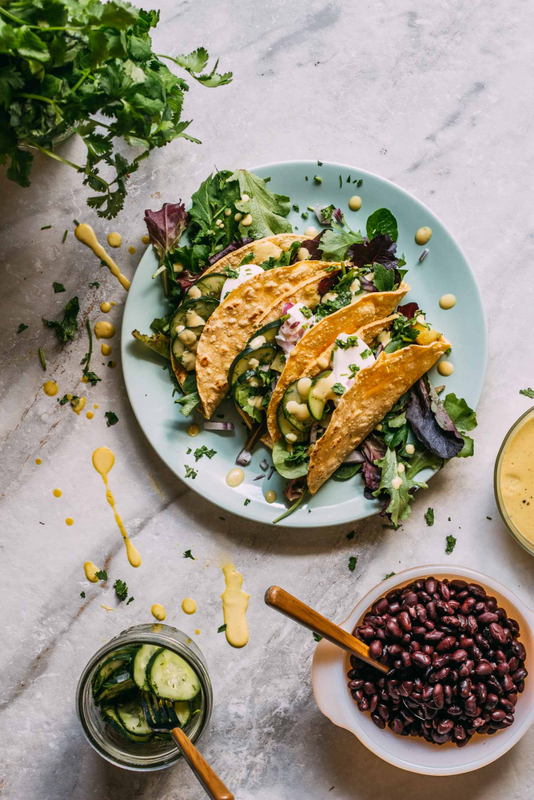 Our Quick Roasted Potato Tacos with Maple Mustard Sauce is the love child of a bowl we enjoy at Dandelion Communitea Cafe and our taco habit. This new recipe came into existence after the experience of enjoying a bowl they playfully refer to as, “Tater Swift.” Adorable, right? Dandelion is one of our absolute favorite casual spots to eat delicious, vegan food. So, if your ever in Orlando, head downtown and look up Dandelion. 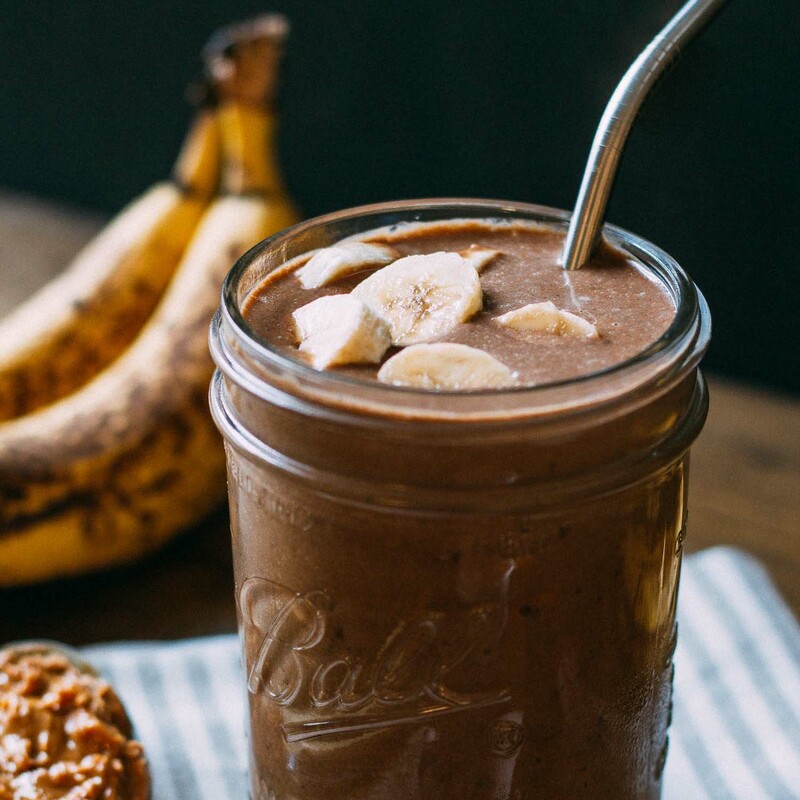 We have another recipe “love child” thanks to the beautiful inspirational food of Dandelion. 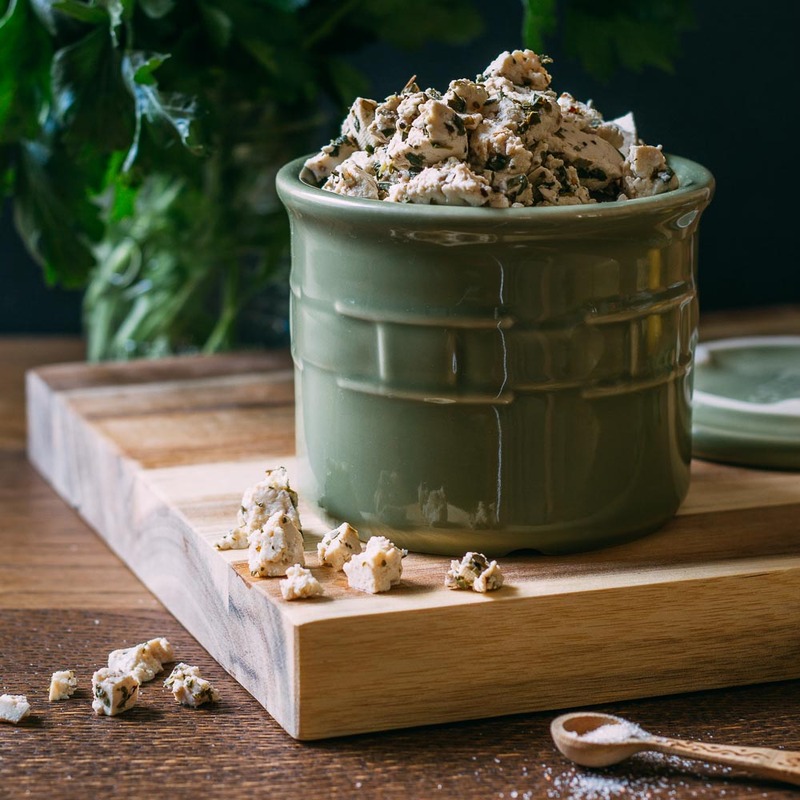 Have you tried our recipe for a Tempeh Blue Cheese Buffalo Bowl? Dandelion’s Buffalo 66 is the first dish where we venture into the beautiful world of tempeh. By the way, if you’ve haven’t tried tempeh yet, you just must. Our Buffalo Bowl comes complete with creamy, oil-free, gluten-free, plant-based, Blue Cheese Dressing! We also want to take a moment to shout out to Allrecipes.com. On that site that we read the suggestion of adding a little cayenne pepper to the roasted potatoes. That little extra kick is subtle, but welcomed, depending of course on how heavy-handed your sprinkle. We went lite on the cayenne but do like to include enough to notice a tiny bit of heat. You’ll soon read that we go into detail about how to roast potatoes for this recipe. And we think that this oil-free roasting method will come in handy for whenever you crave a side of roasted veggies. Quickly roasted potatoes pair nicely with a veggie burger. And nothing tastes quite as fantastic as oven baked potatoes with a generous drizzle of our flavor-packed Oil-Free Spinach Walnut Oregano Pesto. Like most pestos, our pesto is no-cook. So what’s so unique about ours? Well, besides being fabulously oil-free, ours features omega-3 rich walnuts! We want you to know that we’re glad to have you here with us. And also, we want to e sure to communicate the value of your support through kind comments. It’s a great benefit for others to be able to read your comments, suggestions, and questions. So be sure to let us know how much you love these tasty tacos! Thanks, also, for pinning and sharing our recipes on Facebook, Pinterest, and Twitter. Every single time you comment and share our recipes, you tell the world that eating vegan is not only doable, but it’s also delicious! By the way, you’re going to want an extra batch of the Quick Pickle Cucumber Slices in your fridge. So, go ahead and get two jars ready for your batch of homemade pickles. You’re going to love these crunchy beauties! And while you’re stirring up the Maple Mustard Dressing, Dip or Sauce, make a double batch of that, too. You’ll appreciate having a helping or two extra to drizzle, dip or spread wherever your tastebuds lead! 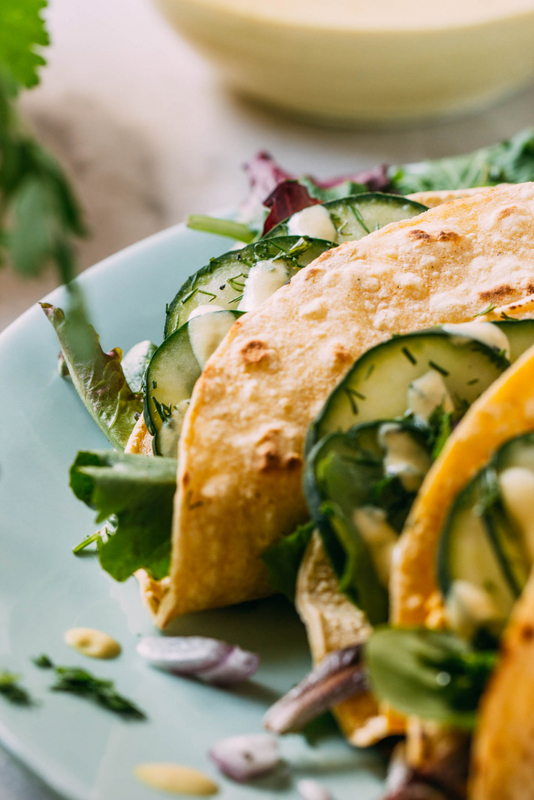 If our eating experience is any indicator, this savory potato taco recipe is bound to become a go-to when you’re craving a delicious veggie-stuffed tortilla. The roasted potatoes are fabulous served as we suggest here, but they’re also excellent served as a classic side dish all on their own or drizzled with our favorite plant-based, dairy-free, oil-free and gluten-free, Creamy Vegan Blue Cheese Dressing. Just whip up a batch of our no-cook Quick Pickle Cucumber Slices and oil-free Maple Mustard Dressing, Dip or Sauce while the potatoes roast. Then once the potatoes, pickles, and sauce are done, warm some terrific tortillas! To enjoy the roasted potato portion of this recipe another day, we suggest pairing them with our Spinach Walnut Oregano Pesto or dip them in our 3-Step Sage & Cashew Cream Cheese Spread for yet another way delightful way to enjoy some pure, oil-free, potato pleasure! 1/4 cup of veggie broth or more if needed - We sometimes use a little of this miso mixed with water to make a plant-based veggie broth when we're out of vegetable broth or only need a small amount. three pounds of raw potatoes cut into evenly sized, smallish, pieces - We used organic red potatoes for our tacos. 5 or so fresh sprigs of thyme, or more or less to preference, or about a tablespoon of dried thyme - Can we ever really have too much thyme? LOL! We like this brand for purchasing dried herbs in bulk. a tiny pinch of cayenne pepper, or not, to preference - We say, YES, to just a little heat! corn tortillas or another variety of preference - We prefer gluten-free, organic, non-GMO tortillas. a dollop of your favorite plain plant-based vegan yogurt or sour cream - We enjoy using Kite Hill brand of plain plant-based yogurt in the place of sour cream. If you haven't already made a batch of our Quick Pickle Cucumber Slices with Fresh Dill, start those now so that they can marinate as the potatoes bake. And then stir up some of our delicious, oil-free, Maple Mustard Dressing, Dip or Sauce. 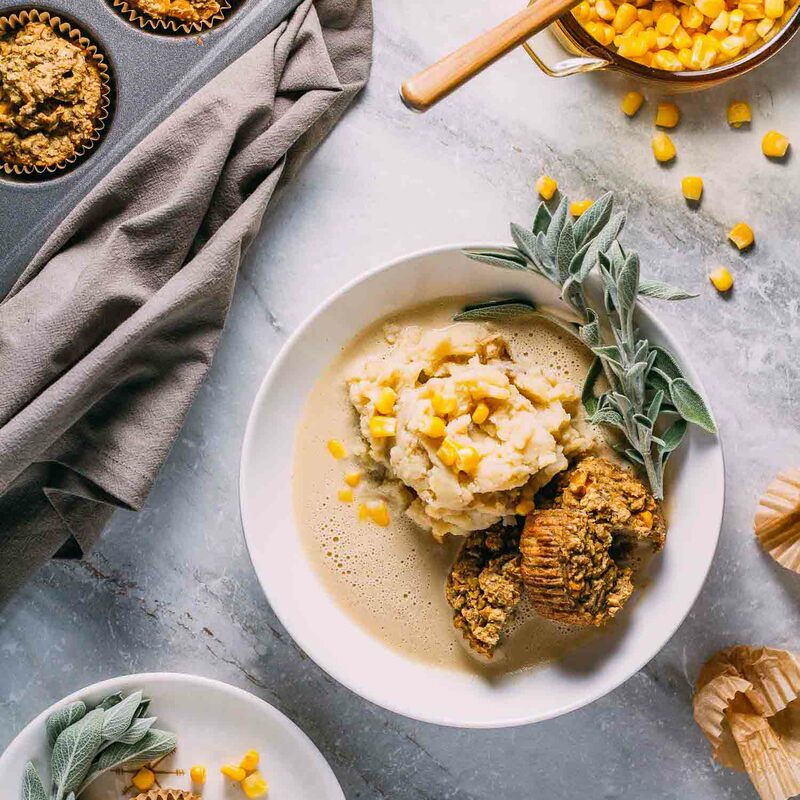 To get the potato portion started, preheat your oven to 400º F and line a rimmed baking sheet with either parchment paper or a reusable silicone liner. Next, pour veggie broth into a large mixing bowl along with the sliced potatoes, thyme, salt, pepper, and cayenne. Stir to coat the vegetables evenly. Now fill your prepared baking sheet with an even layer of seasoned potatoes. We've found that placing the potatoes skin side down makes them less likely to stick. There's no need to worry about the food sticking because the high heat creates a bit of skin on even the cut side of the potatoes. The parchment paper or silicone liner also does a terrific job of preventing sticking. Bake the potatoes for 20 minutes before removing them from the oven and flipping them over using a spatula. Return the flipped potatoes to the oven and bake for another 10 to 20 minutes, periodically checking that they're cooking evenly and rearranging as needed. It should only take a total of about 30-40 minutes total cooking time. Larger chunks of potato may require additional cooking time. If some appear a bit undercooked, turn the oven off and return them to the oven for just another few minutes. Remove your roasted potatoes from the oven and toss once more. Give them a taste to adjust the salt, black pepper, and cayenne pepper to preference before serving. We love these potatoes in this taco recipe as well as on their own as a simple side or snack to eat with ketchup. We also enjoy these drizzled in our flavor-packed Oil-Free Walnut Spinach Oregano Pesto. Now that all of the components are ready to go, warm the tortillas on a hot, dry, iron skillet or another skillet and then fill with roasted potatoes, greens, onions, cilantro, quick pickles, special sauce and any or all of the other mentioned toppings and chow down! Since one pound of potatoes generally counts as enough for three to four servings, we estimate that 3 pounds of potatoes should provide taco filling for about 12 entree-size servings. The nutritional info below accounts for the potatoes only since the suggested pickle and sauce toppings listed have nutritional info supplied with each of the individual recipes. We also recorded the nutritional info in this manner because not everyone will choose the same tortillas, wraps, additional optional toppings, etc.